Stock bottle of LGO next to my leaking dropper bottle. There have been times in all of our lives when we have had to “Eat Crow”. Serendipity struck this last weekend and I must set the record straight and acknowledge that I was probably wrong about downplaying the importance of Lemon Grass Oil (LGO) in swarm trapping. I had arrived at that conclusion last year after a swarm left one of my traps in favor for a bee tree that had not overwintered. I knew there was LGO in my trap, and none in the tree. Therefore from this one instance I became convinced that LGO was hoodoo trickery!!!! I continued to place it in my traps because I already had a bottle. I was totally convinced that old comb was the key to attracting swarms. Last weekend my wife and I had the opportunity to go to a local winery with some friends. In the morning I swapped out two occupied traps with empty ones. Sometime last week my bottle of LGO developed a leak, and it was all over the inside of the jar where it is normally stored. As a result I got LGO all over my hands and though I tried to clean it off, my fingers still smelled of it. At the winery I began to hear the familiar tone that always makes me start looking around for a flying honeybee. I looked down just as the bee landed on my fingers. I had been holding my wife’s hand in the car on the way there. Amazingly enough there were bees checking her out as well. One of our friends said something about the bees being attracted to us. They were right, but they had no idea of the reason. I am certain it was the LGO, because no one else had bees landing on them. Bee checking out the box after a fresh LGO application. When we returned home it was still daylight. Trap 30 had been hanging for a while. I had seen NO scouting activity around it in days. Using my dropper I put a little less than 0.5-mL LGO on the floor of the trap through the main entrance. Within minutes there were bees flying around the box. I visit beesource.com several times daily. I spend a lot of time in the Forum Page – Swarms, Trap-outs, and Cutouts. There are a lot of threads on swarm trapping. For months I have been posting in the forums minimizing the importance of LGO. I will NEVER do that again. LGO must be attractive to honeybees. I still think it is important to have old comb in your traps allowing the queen to begin laying as soon as it is sufficiently cleaned by the bees. Also old comb does not seem to get destroyed by moths as readily as new comb. What do you think? Questions? Comments? 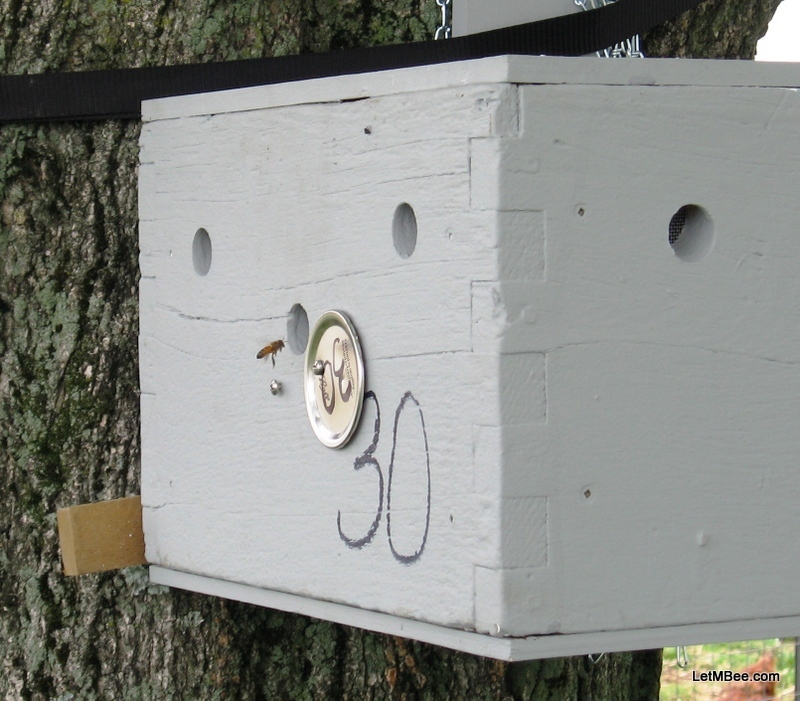 This entry was posted in Feral Bees, Posts, Swarm Trapping, Uncategorized and tagged bait hive, bee, beekeeping, Indiana beekepeing, Jason Bruns, Lemongrass Oil, LGO, swarm trap, swarm trapping. Bookmark the permalink. 8 Responses to The power of LGO! 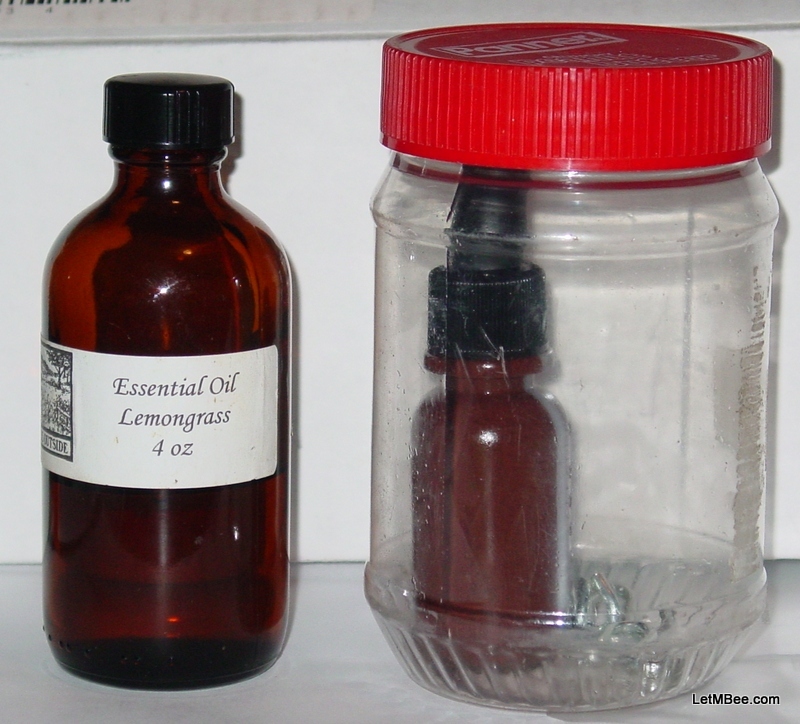 I did not put any old comb in my traps this year since I simply do not have any, I did paint the inside of the boxs with bees wax and I mixed a small squirt bottle of LGO, some rubbing alcohol (to dissolve the lgo in water) and water. I have been spraying the trap entrances with it, late may june and july are our swarm seasons so it will be interesting to see the results. I will be checking your site for progress. I made a believer out of at least two local beekeepers this year. After coming and viewing my traps this spring one of them has caught 1 swarm and the other two. It is a great and sustainable way to obtain bees. I foresee only one problem for it in some areas. In places where swarming is heavily prevented by beekeepers not only may the feral population be lower, but fewer swarms will come from beekeeper’s hives. I think the idea that swarms come from hives of “lazy” beekeepers is an idea that MUST change. Their form of natural reproduction must have benefit to bees as a whole or it would not have developed over countless millions of generations. I mean FOR PETE’S SAKE!!! The way that honey was obtained hundreds of years ago was to KILL the bees in a colony to obtain their honey. All of their stocks were obtained by swarms, and with that type of management bees were able to overcome and are still here today. We 21st century snobs think we are so smart with our technology and intensive management, yet all of these problems face bees….. I live in MONO-CROP HELL with all of the spraying and lack of diversity that it creates, yet there are feral colonies strong enough to swarm to my traps. I don’t think big AG is good, but I don’t think neonicotinoids alone are causing all of our problems. Genetics must play a part as well. You should try putting two traps next to each other, one with LGO and one without, and see what happens. I have not tried LGO yet. Where do you recommend getting it? If I had more comb this year I was going to try that very experiment. Since I was so short on it I decided to not take any chances and just added LGO to all of the boxes. About how much is o.5 ml? Is that half a dropperful? I got my LGO from mountainroseherbs.com. My droppers have graduations on them. I just fill it up to the 0.5mL line. I don’t know if that is the best volume to add, it was just a shot in the dark. Next year depending on how many traps I put out I may run an experiment putting different amounts in different boxes and then comparing. Perhaps I could get just as good a results by using less. I just love beekeeping. So many aspects of it remind me of Mr. Wizards World when I was a kid! The last swarm I caught was with lemongrass oil alone. I had baited a hive with lemongrass oil and spilled some on my deck. Withing an hour a swarm of bees had landed on the deck next to the spill. What is strange is that the hive with comb in it caught nothing, but the deck did! I had to actually capture the swarm and put them in the hive. There is no doubt that it’s attractive to bees. Thanks for reading…. and commenting.